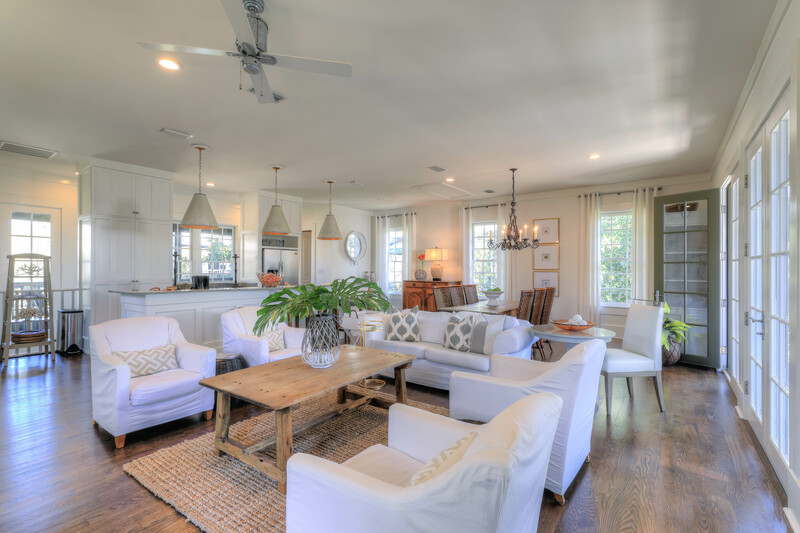 If you’re looking for a large home with plenty of open space that also offers plenty of alcoves to relax and rejuvenate, choose the Abaco Pearl Cottage in Rosemary Beach. Built with a great separation of space, all of the bedrooms are on the first floor. 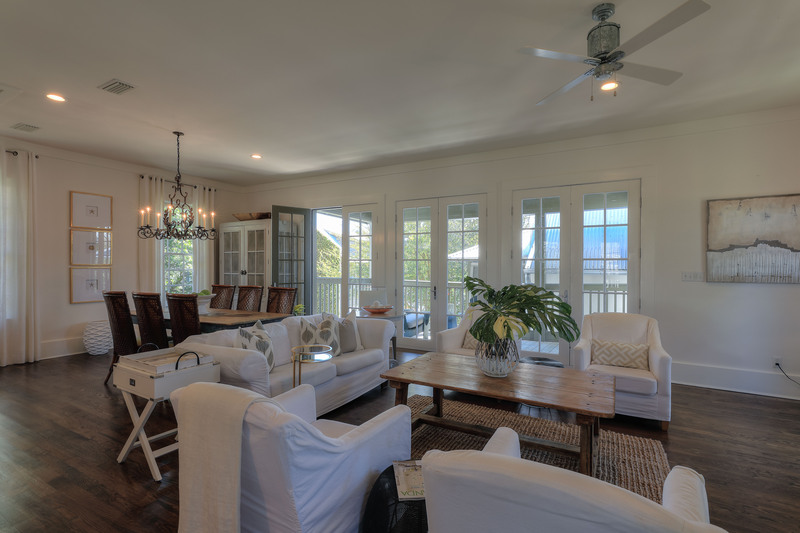 The kitchen, dining and living room are all on the second floor with balcony space overlooking the front and back of the cottage, comfortably furnished with a swing and inviting lounge chairs. 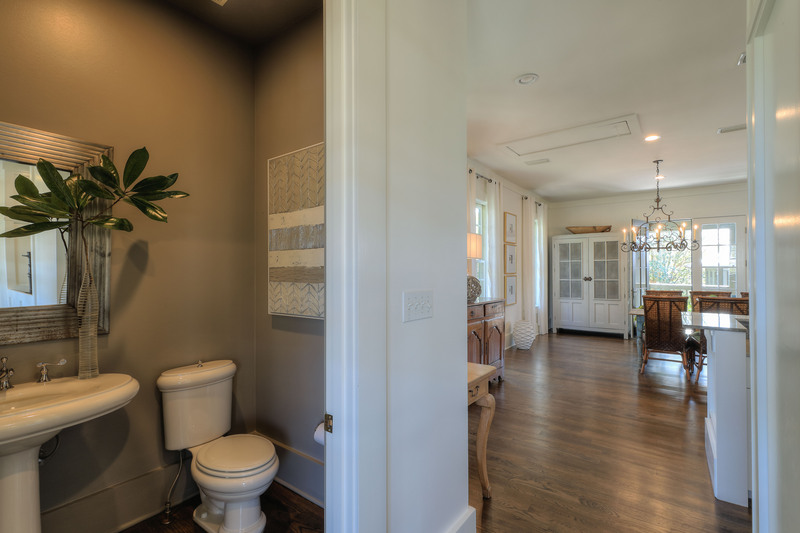 Hard wood floors and neutral tones are accented with French country décor throughout. 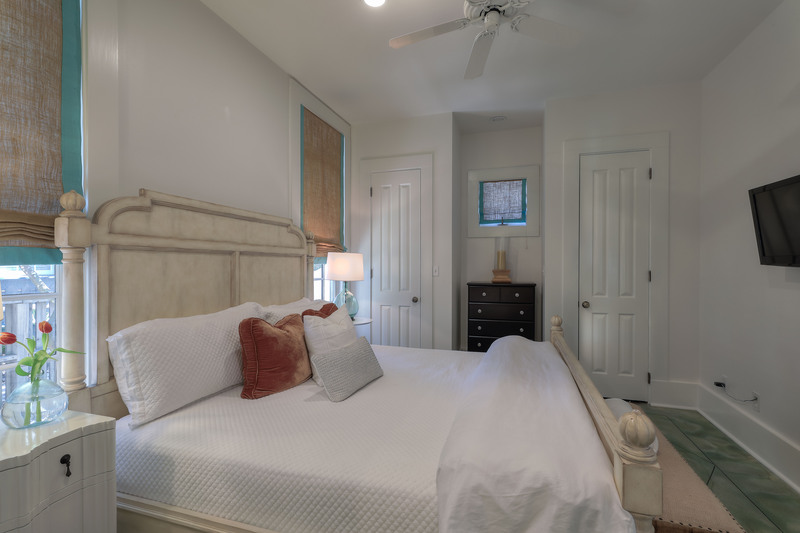 Conveniently located near the Coquina Pool, Main Street & of course the beach, Abaco Pearl Cottage is the perfect choice for a 30A getaway. 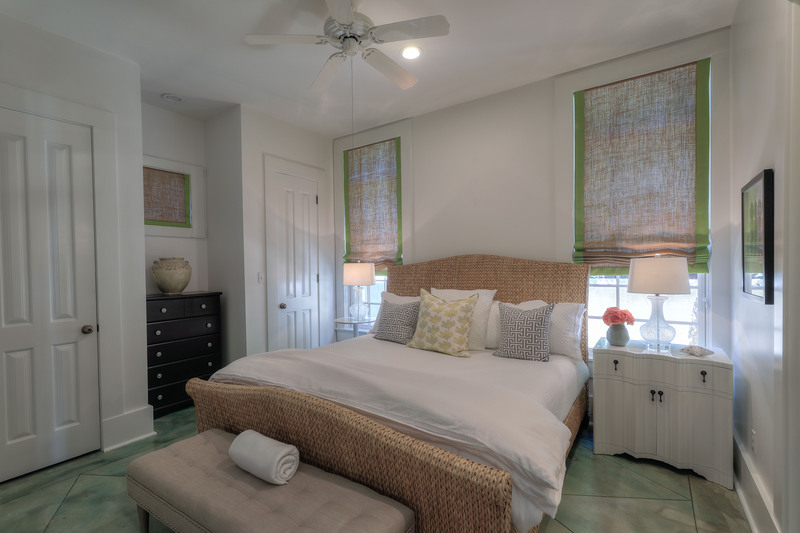 Abaco Pearl Cottage offers two master suites, each with king bed and full private bath. 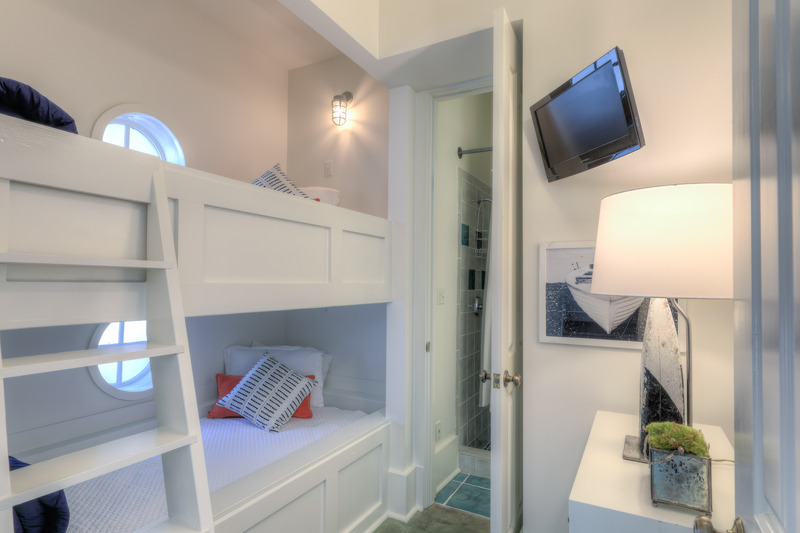 The third bedroom holds built-in twin bunk beds with a small private bath to share. Each bedroom has a flat screen TV mounted on the wall, with cable hooked up in both master suites. A flood of natural light fills the stairwell and second floor each day. The entire second level is essentially one spectacular great room that invites you and your guests to get together and stay together as you reminisce about special memories and start to create new ones. 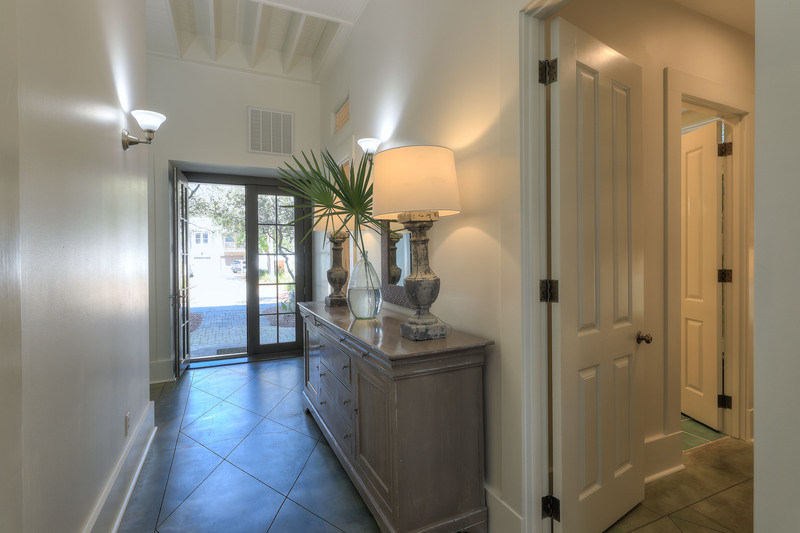 Upon reaching the top of the stairs, turn the corner to access the kitchen and living room. 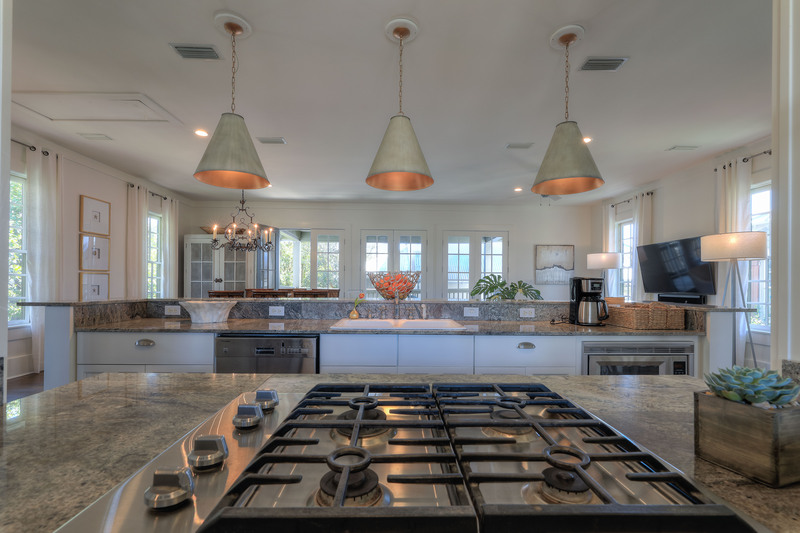 Cooking is encouraged at the Abaco Pearl Cottage, where the kitchen is fully equipped with top-of-the-line stainless steel appliances and all the standard kitchen utensils one may need in preparation for a nice dinner at home. Enjoy the spacious floor plan, detailed with tall ceilings and many windows including views of the dipping pool in the backyard. 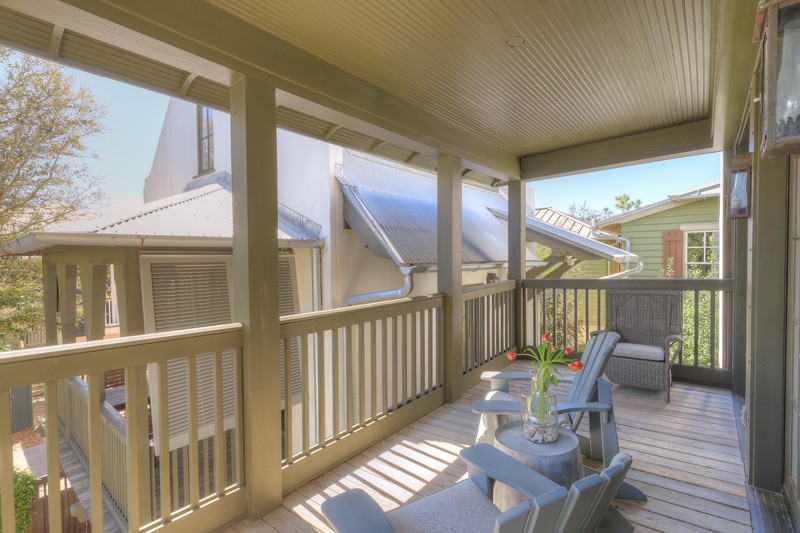 The back terrace is styled with four sunbathing lounge chairs and a gas grill. Need a little more space? 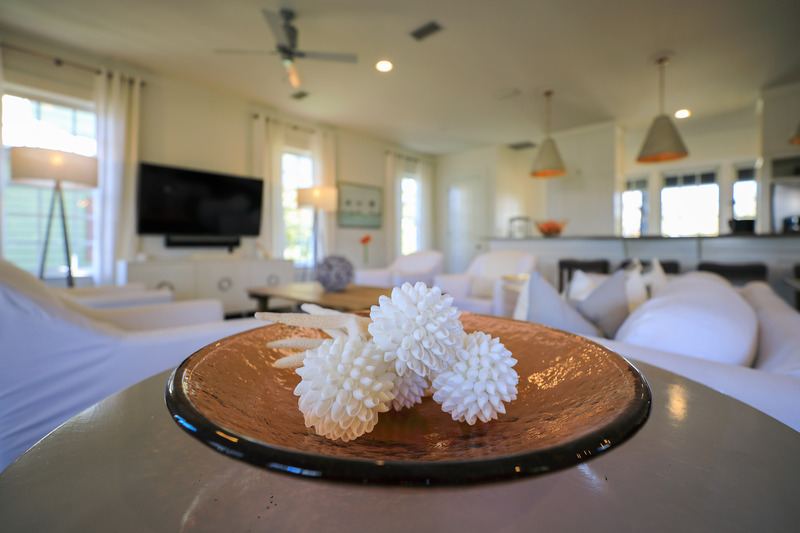 Rent the Abaco Pearl Carriage House. The studio carriage house is furnished with a king bed and full bath, as well as a small kitchenette and balcony also overlooking the pool. Being located above the garage unit, Abaco Pearl Carriage House is completely independent of the main cottage but still close enough be included with the rest of the group from the main house; Great for a small family. •	Newly Upgraded Audio/Video with 65" Samsung Smart HDTV, Apple TV & Logitech All-in-One Remote, Sonos Sound System! An AMAZING House and Vacation!!! Love, Love, Love!! 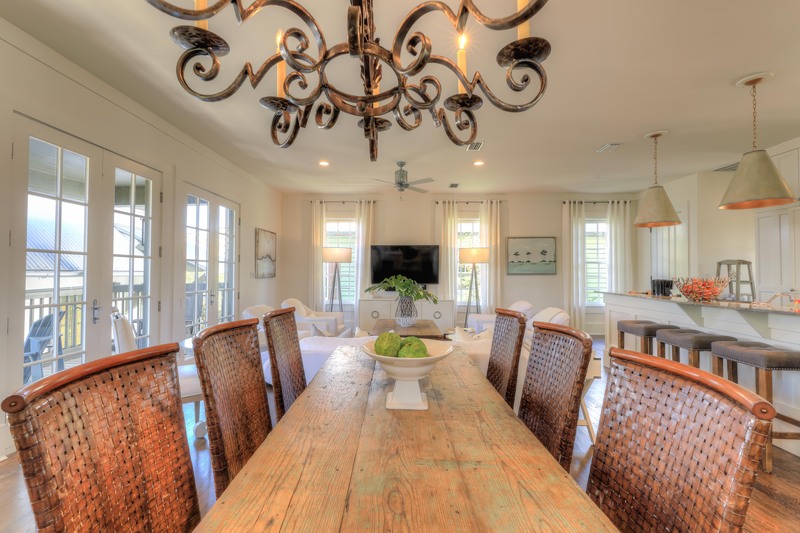 We can't begin to describe what an amazing time we had at this property in Rosemary Beach!! We are already planning our next vacations there! The home is very well appointed and the management company we so easy to work with. We love they put everything we need to know in a mobile app that could be shared with our whole family to access. We had one small issue with the pool heater and they were there in 15 minutes to take care of it! They even checked in on us several times during our stay, which was a first and we'll definitely only use them going forward. Thank you 30A Luxury Vacations for making this the trip of a lifetime!! We loved this house!! The pool was so nice for the kids and the walk to the beach was so short and convenient, we could not ask for more. 30A Luxury Vacations was a breeze to work with and was always there to help and answer questions. Their app was great to for easy reference. 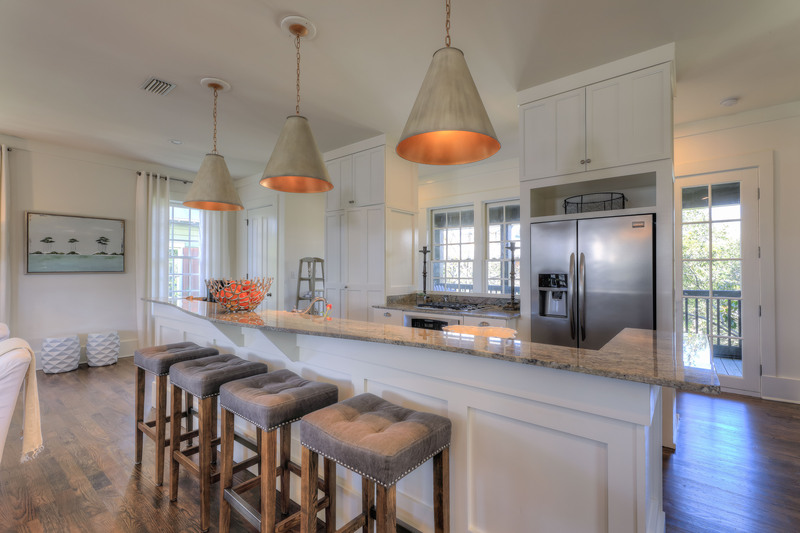 We can not wait to come back to Rosemary Beach and will only use 30A Luxury from here on out! Thank you!! House is really nice and super clean! Would definitely book again. Probably best for two sets adults and two little kids, for total of 6. The bunk beds for kids were cute and really comfortable, but the room and adjoining bathroom is very, very small/tight. Then again, as kids...they can manage to be in it's totally fine. King sized rooms had super comfortable beds and it was super quiet, so much that we all slept late every day. Living Room/kitchen upstairs was perfect.. nice and bright/huge, open layout, and was fun entertaining in evening. It's exactly as described on the website and even closer to beach and pool than we thought...just perfect, one block from pool and about one block and a smidgen more to boardwalk. Bikes were great as well as with parking. Construction no longer an issue next door as they are working quietly inside. Management company was exceptionally responsive replacing broken garbage can and fixing toilet on very first day. There were a few items missing from kitchen that they also replaced immediately without any hesitation. Only thing I would recommend they take a look again at the front lock on door; it's really hard to open compared to back door. You really have to play with the key quite a bit before it turns, whereas back door is easy. Not a show stopper, it would be nice to fix. Pool was nice to have and we thought we would use it a lot, but we barely used it in the end. The carriage house is close, but even with people there, it did not impact us or them. It was totally fine. Again, amazing house and management. Perfect, peaceful, beautiful! We will be back! This house has everything you could need on a vacation to Rosemary. It provided every amenity. I will stay at this house every visit to the area if it is available. Thank you for your excellent review of Abaco Pearl Cottage! 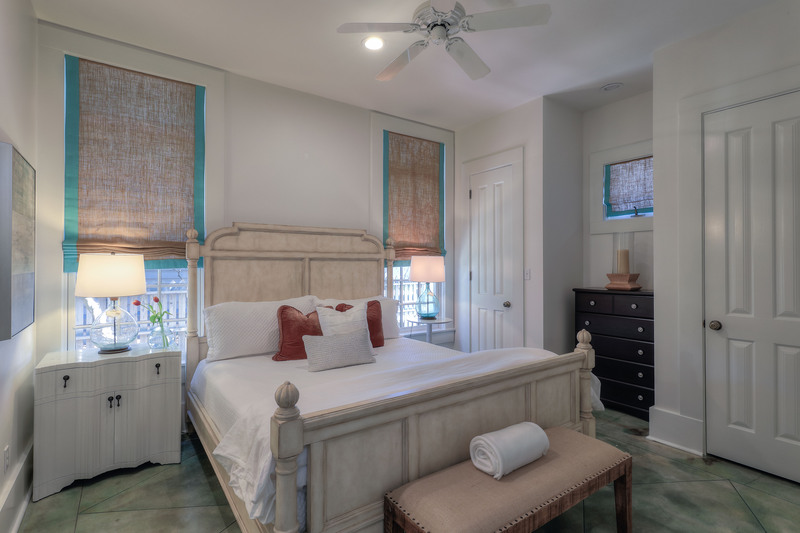 30A Luxury Vacations strives to provide our guests with comfortable accommodations and the essential amenities for an absolutely flawless and worry-free stay. 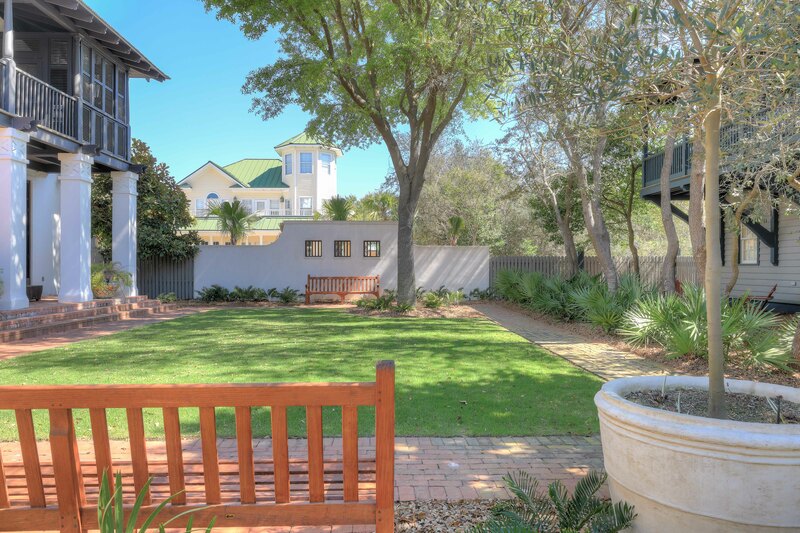 We look forward to welcoming your every visit to Rosemary Beach! Great experience! Property was even better than description. Customer service was excellent and would not hesitate to recommend this property to anyone. We rented the cottage and carriage house together and they met the needs of our family perfectly and our two infants loved the swimming pool. Thank you for your incredible review and for recommending us! The team at 30A Luxury Vacations strives to provide a unique boutique service to all of our guests and clientele. We are thrilled to hear your little ones had a blast in the private pool at Abaco and that both homes met your needs! Please come back and see us soon! We had a great time at the Abaco Pearl. 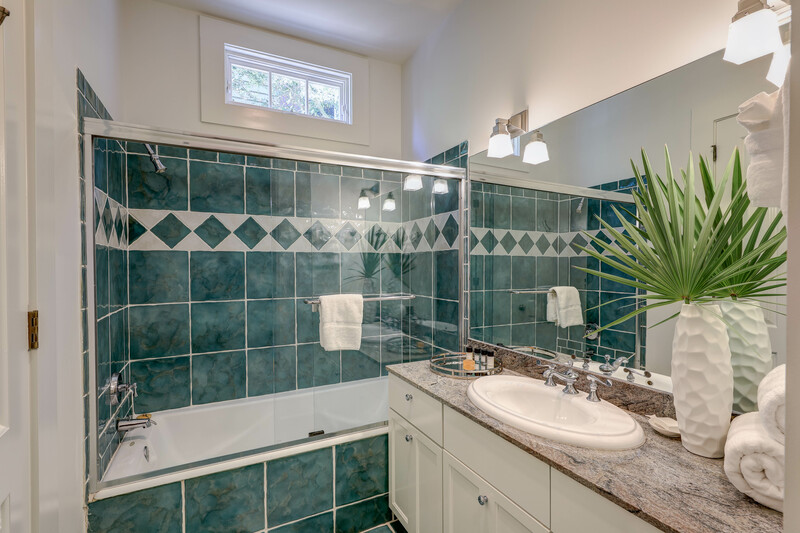 The property is nice and in a great location to the beach, playground and Coquina Pool. All are easily walkable with small kids (which we had). The kids loved the bunk beds, but you should know room is very tight and only good for little ones. The bathroom in the bunkroom was tight, but workable for the little kids. The master bedrooms were all fine. Missing a remote for the tv in one, but not a dealbreaker. The upstairs was well appointed and spacious for a family of four. The couch was small, but there was room for everyone. The sink has some wear and tear and needs an update, but other than that the kitchen was outfitted well with all the things you need. The pool outside was small but about 4 ft deep, which was great for dipping and kid's play. 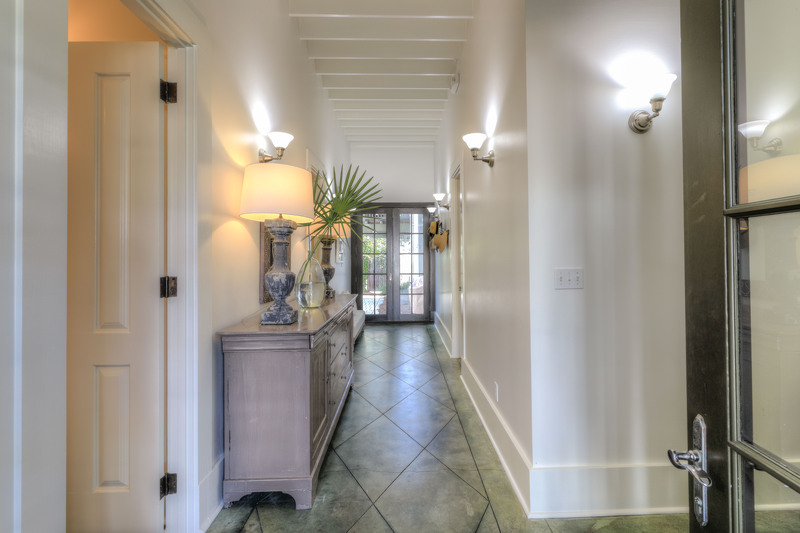 The carriage house entrance is through the courtyard that shares the pool, the pool is for your use only, however. We did meet the people renting the carriage house, which was fine, but if you prefer absolute privacy, then you may want to take it into account. The two decks (front and rear) were nice to sit on and enjoy a drink at night - the cushions may need a replacement soon as they are showing some wear and tear. Rosemary itself is under a lot of construction - and being 20 years old or so, is to be expected. A lot of onstreet parking has been taken up by dumpster from renovations. The property next door is under a full gut (which we were told about in advance). The construction was quite and done during reasonable hours, however. We really did not have a problem with it, but it is something to note. Rosemary is showing its age somewhat. Somethings could use a good coat of paint and patching (like the Coquina Pool exterior), but these are all things to be expected by such a heavily used area. Rentals through 30a Luxury Vacations was easy and quick. The folks there are great and prompt to any request. We will definitely be booking through them again. Excellent stay overall. Based on 7 years of Rosemary rental experience this was one of the nicer rentals, and definitely the best management company experience. The home is not perfect, but definitely better than most in Rosemary with only minor deficiencies. Great home for a small family or two couples. Very clean, pet friendly, and all amenities in good working order. Loved the Harmony remote, Samsung TV /Apple TV video/Sonos audio system. The home has a lot of windows and light on the upper main level, nice kitchen (w/ pretty granite) and the open floor plan feels very spacious. Loved the front and back decks. The small pool was nice and the heater works quickly. The house was very nice and well stocked. Location was wonderful. Super short walk to Main Street and next to beach walkover. Kids loved that playground and kid friendly pool were on the same block. Would definitely stay here again. Highly recommend. Thank you very much for staying with us! We are glad that you enjoyed your stay in the Roger's Cottage! Please let us know if we can be of any assistance in the future and we look forward to accommodating you again! The house was beautiful! Plenty of room for everyone to do what they want. Kitchen was fully stocked and plenty of pans etc to cook with. The only complaint is one of the bedroom toilets did not have enough water in the bowl, so we had a plumbing issue one day. But maintenance came immediately and fixed it. The house was a tad warm at times despite adjusting the temp. 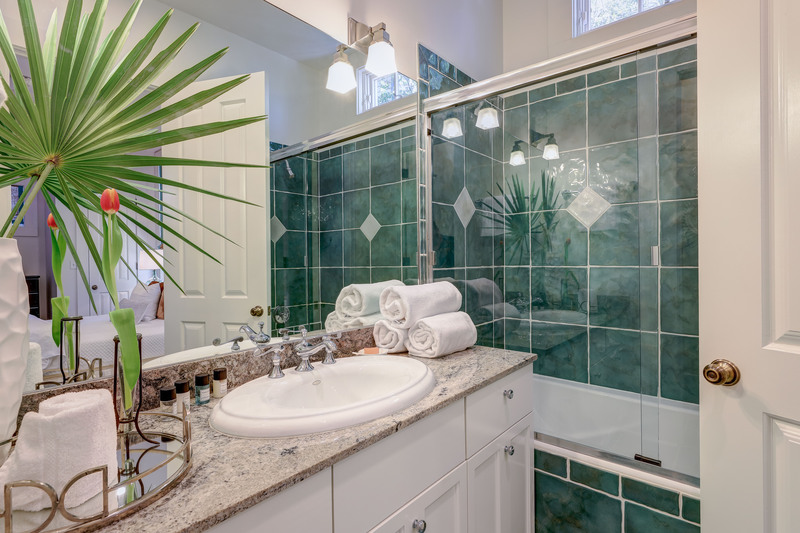 Overall, the house was beautiful, clean and accommodating. My husband, daughter and son-in-law stayed at Roger's cottage over Christmas weekend. The space was perfect size for everyone. The room with bunk beds would be great for children under 12. The living/kitchen/dining area is particularly spacious. We enjoyed time on the porches, in the pool and riding the bikes provided with the rental. There is room for improvement. The bed pillows were pretty worn. I'd definitely bring my own, if you are a picky sleeper. There are down pillows in the living room and the dust and dust mites from them are everywhere. We actually had to vacuum the chairs so my daughter, who is allergic to down, could stay in the room with us. (This was after she took Claritin and a sudafed.) I'd advise the owners to get more allergy friendly pillow accessories. The cleaning company should probably wash or vacuum the slip covered furniture as part of the cleaning process. Overall I am giving the stay a 4. The house has some nice amenities and is very conveniently located within the community an very close to beach access. 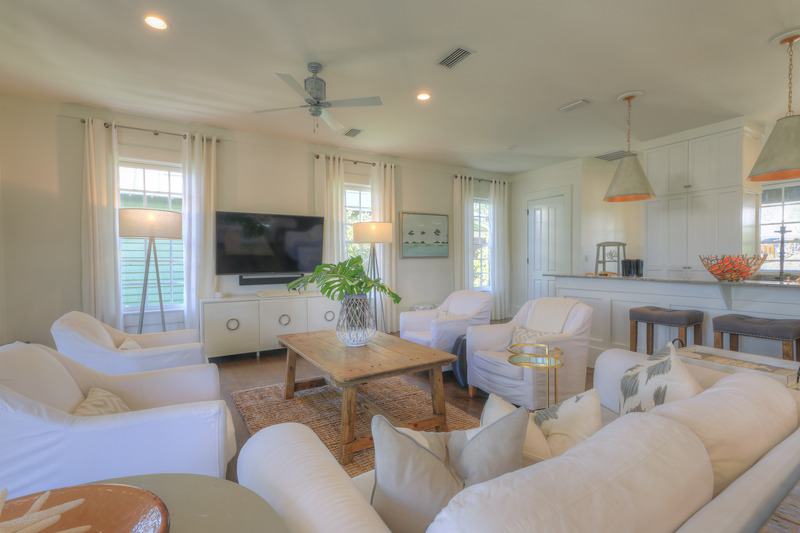 Roger's Cottage is convenient to the beach, pool, park, and green spaces. It's at the end of a street, so it is quiet as well. We enjoyed the bikes and small outdoor heated pool. 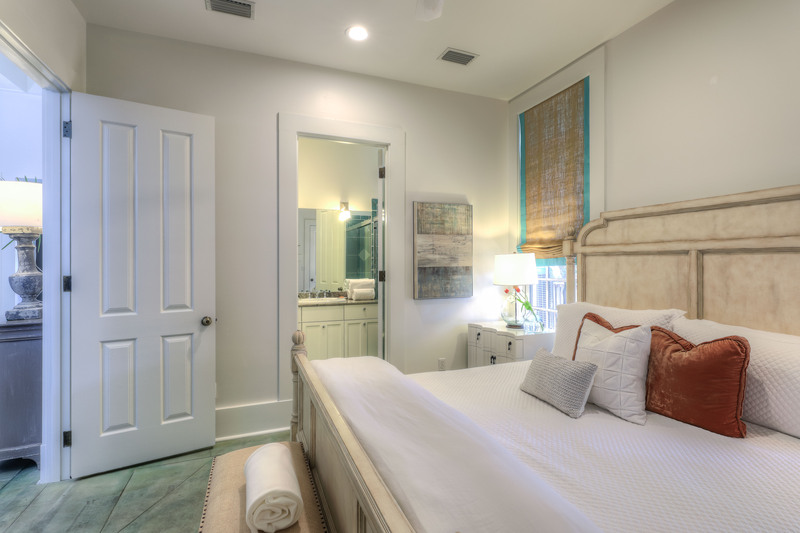 The house is decorated beautifully with new bed linens and pillows in the bedrooms. 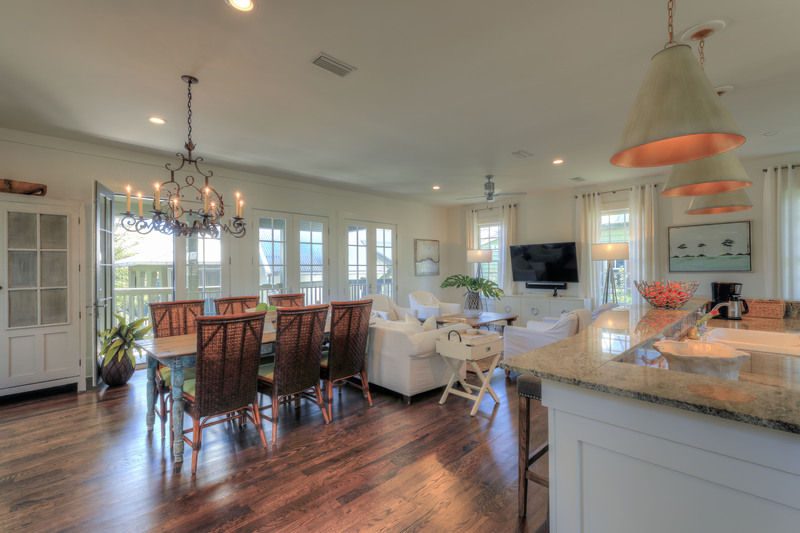 The second floor open floor plan is great for families. 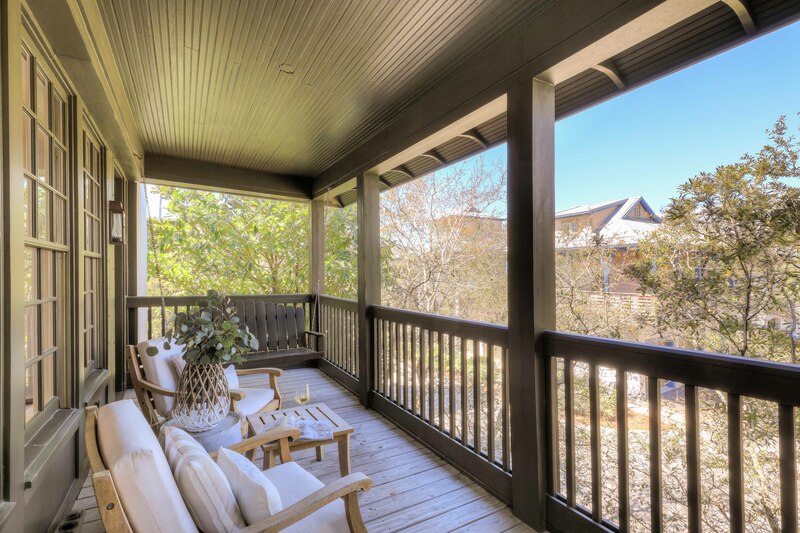 The only drawback is the small carriage house shares an entrance to the property and the balcony overlooks the pool and back porch area. It was awkward having a family so close it what should be a private area for the cottage owners to enjoy. Overall, we had a great experience with the home and the property management team. If you can rent the cottage and carriage house for a large family this home would be ideal!! Thank you very much for staying with us! We are glad that you enjoyed your stay in the Roger's Cottage! 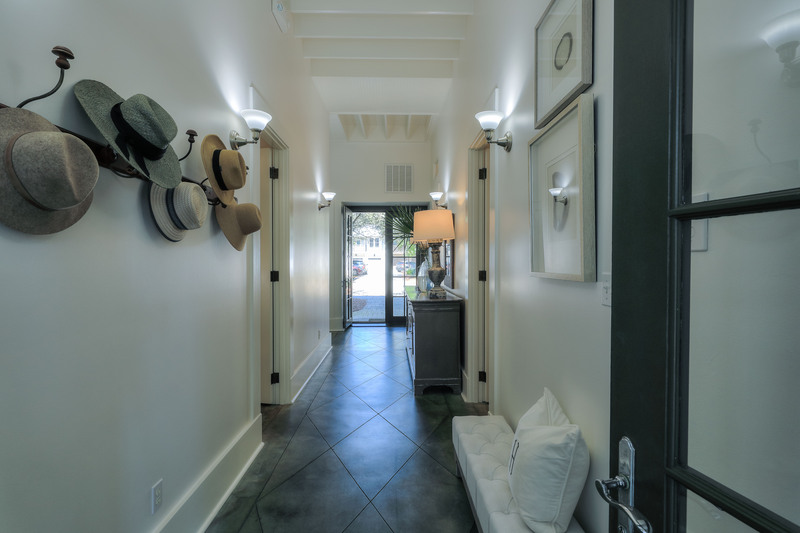 The proximity of the carriage house to the main house is close, but we are happy that you were able to enjoy the quiet and convenient location. Please let us know if we can be of any assistance in the future and we look forward to accommodating you again! We could not have asked for a more perfect experience!! 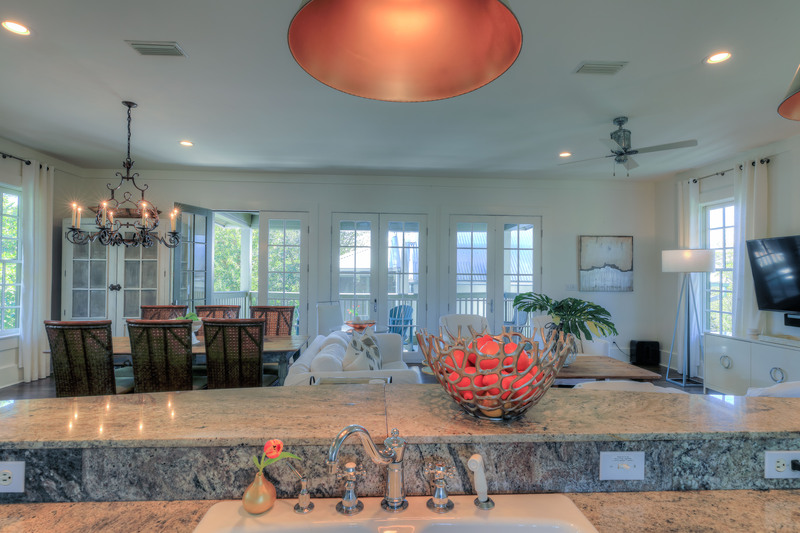 We've been coming to Rosemary Beach for years and had such a wonderful time at this property. The private pool, the quick walk to the beach and the gorgeous decor were the highlights, but the management company took the experience to the next level. Their proactive service made the experience and trip to remember. 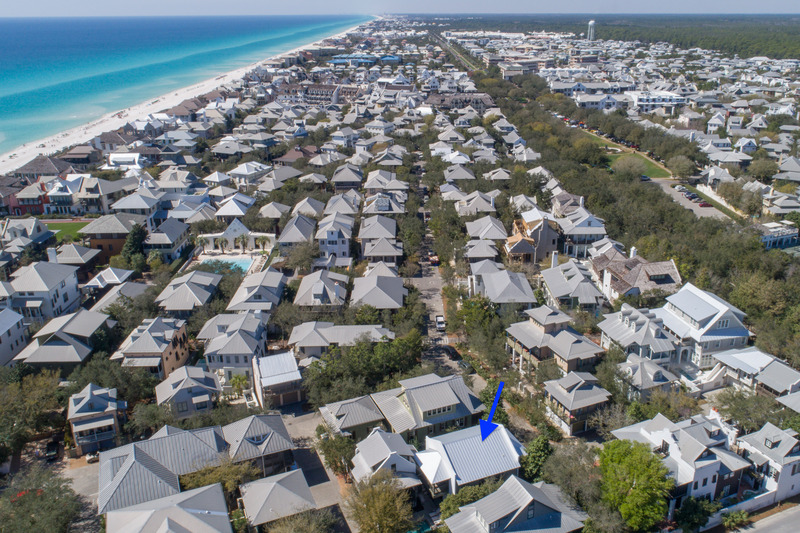 Thank you 30A Luxury Vacations! We had a very nice week, were pleased with the property, and would stay there again. 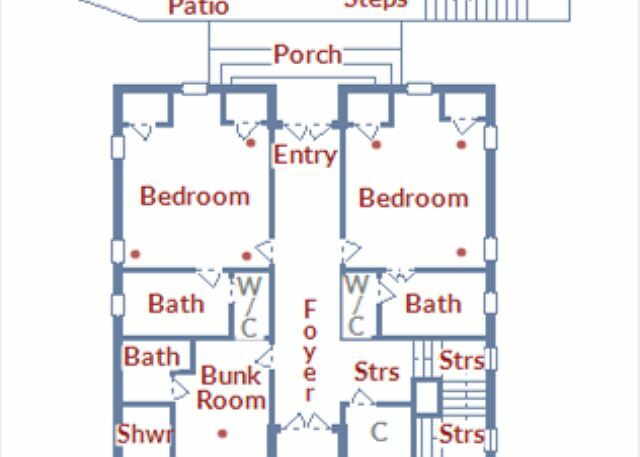 The only hesitation is that the carriage house is rented separately and could be a little awkward if that renter was loud or disruptive. Two different renters were there when we were and we had no problems. 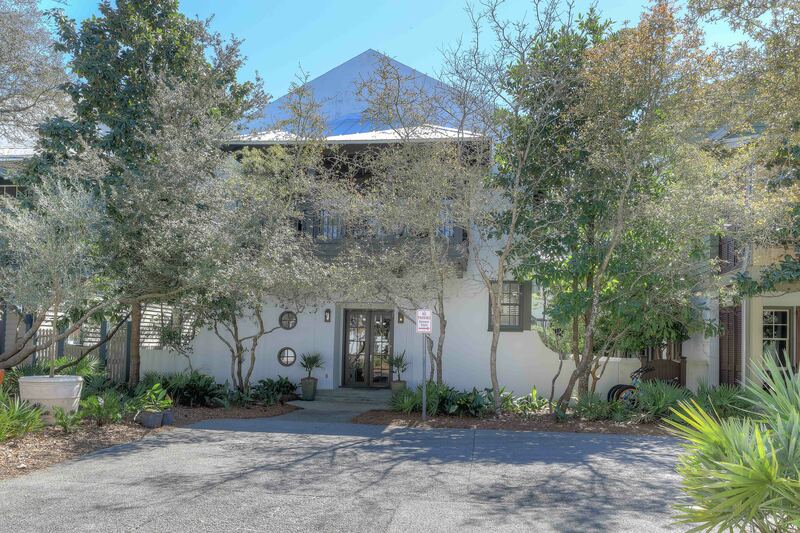 Excellent location, only a block or two from both the ocean and Coquina Pool. The beach near the house was one of the less crowded stretches of sand. Property manager was easy to get hold of and very responsive. Overall, we had a good time, but there were a few things of note that were not apparent to us when we booked. 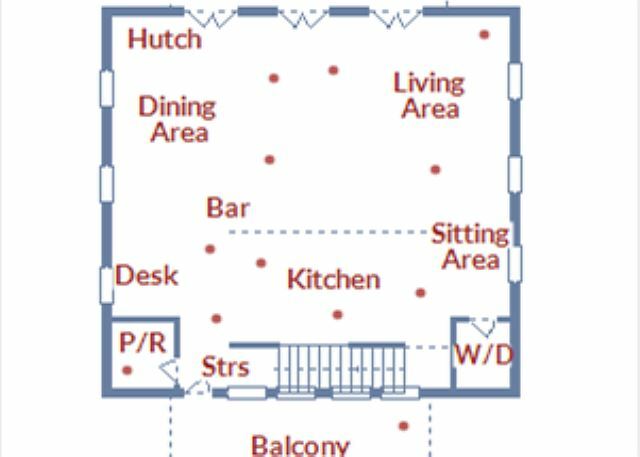 There is a Carriage House on property, which is rented separately from the house. There is little privacy between the two. They are so close to each other that you could leap from the rear balcony of the Cottage to the balcony of the Carriage House without issue. When you book not knowing this, it can be a little awkward. There is a two-car garage for this property (one each for the Cottage and Carriage House), but the garage bays are very tight and will only accommodate mid-sized cars/SUVs or smaller. The street parking around the house is scarce and fills up quick. The private pool is shaded, and there is no privacy there from the Carriage House. The private pool is supposed to only be for the Cottage, but I'm not sure how clear those instructions are made to the renters of the Carriage House. We did come back to the Cottage once and the people staying in the Carriage House were in the pool. Finally, when we arrived at the house some of the kitchenware was not clean. The kitchen sink did not have a stopper (for hand-washing) and there was no soap for the dishwasher. Apparently, you are supposed to provide these things, which seemed odd to me. As a renter of the property, you are supposed to leave the place in a generally clean condition, but there were no basic cleaning supplies at the house. That seemed odd to us, and we have rented beach homes in many different locations over the years. After a conversation with the property manager, he sent his cleaning crew back out to the house and they left us with these things. Lastly, the bedrooms don't have dressers for your clothes, so we ended up having to live out of our suitcases the entire week. My family and I had a wonderful week at Rosemary Beach staying in Roger's Cottage. We loved the house, the lay out of the rooms, the decor and especially the location. Property management was great. They were quick to respond to any questions we had. We had so much fun that we didn't want to leave. Looking forward to next summer! We had a great time overall. Issues with roof leak, outdoor shower and freezer/ice make were inconvenient but handled quickly by staff. Really appreciated the in person tutorial of the TV and sound system upon our arrival. The orientation of the pool area coupled with the proximity to the carriage house made for a somewhat awkward situation. Probably will not choose to rent this house again without renting the carriage house as well, if that is feasible. The only complaint is that the washer and dryer were substandard for a house of this type, location and cost. They resemble a small apartment set up. Additionally, the washer had an unclean odor and the washing room on the whole was not very clean. 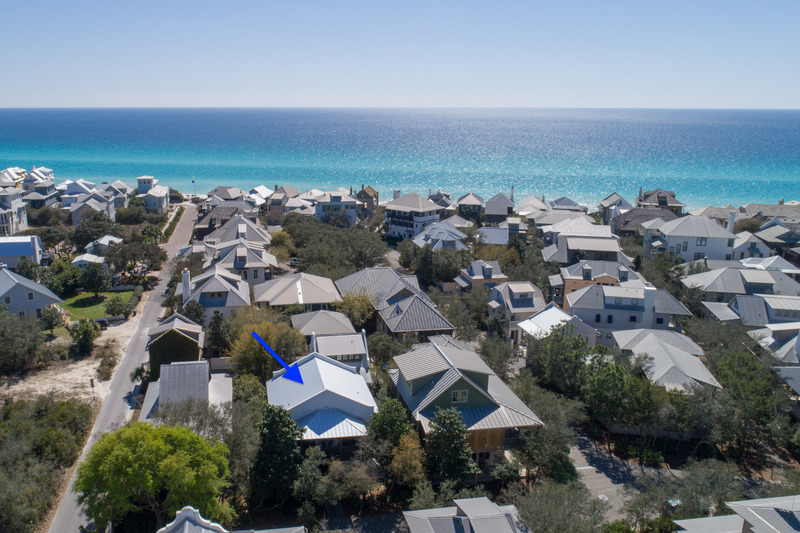 We searched for a home that would fit the size of our extended family in the Rosemary Beach area for a reasonable price. We were thrilled to find this option that was not listed anywhere else. The home was beautiful and well-kept and it was so nice to have a pool on the property. The rental management was very friendly and communicative throughout the process. Everything was great! We are going to stay longer next year! Location perfect! The rental staff was AWESOME!! Cottage is close to beach/very short walk. Playground around the corner. Private pool was wonderful, though small. Carriage house is -><-close, but only rented a few nights we were there. No issues with privacy when rented even though they share gate/entrance and walk past pool to their steps. Garage is too small to park in unless you have tiny car. Street parking wasn't a problem since it wasn't crowded time, but imagine holidays/summer are bad. Courtesy ticket first night saying we couldn't park parallel to garage doors. Complaints: mattresses and pillows not comfortable. Roof leak seen in another review elsewhere (months old) still not repaired. Front door knob fell off in our hand when we arrived, but they came right away to "repair." Was hard to unlock/lock. Front door did not open at all (also broken). I believe it is a known problem in many houses there. 3rd bedroom is closet size. No closet. Shower is 2x2 and unusable. Other bedrooms/baths are nice, but no drawer storage. Kitchen stocked nicely with necessities. Closet size bedroom has 1st level thermostat in it, so that room stayed hot w/door closed but other bedrooms were cold. Needs to be moved to hallway. We might rent again due to proximity to beach and private pool. We very much appreciate your business, and your feedback. 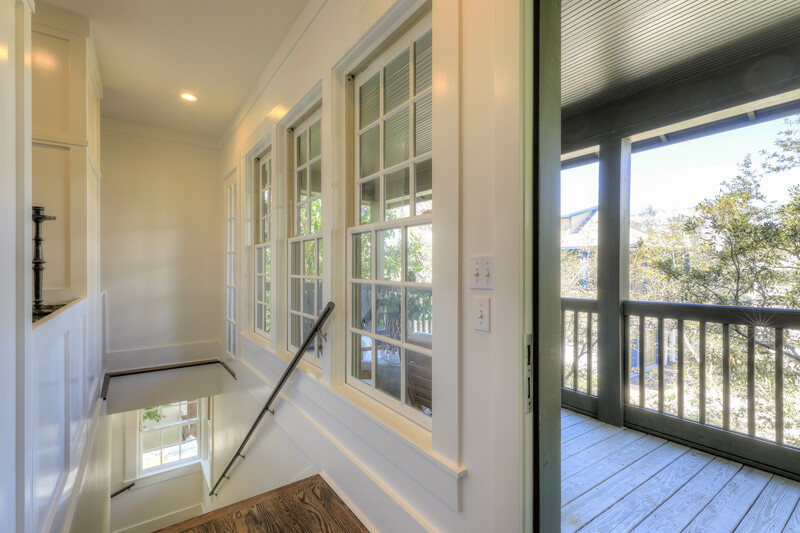 Many of the doors and handles down at the beach are a little bit different to operate since they are hurricane grade doors equipped with special locking mechanisms that many people have not used before. Also, the entire home was recently renovated in May of 2017, which includes more drawer space in the bedrooms, among many other improvements. We hope you enjoyed your stay and look forward to accommodating you again in the future! Thank you again for staying with us, and for your feedback. The house was a great location. We liked being more on the edge of rosemary and out of all the hustle and bustle of the middle walkover areas. The house itself was nice. The bunk room bathroom was tiny and I can't imagine anyone actually using it who isn't a tiny person. Everything was clean and we really enjoyed having the pool right there. We didn't have a problem with the carriage house guests as we rarely saw them but I can see how that might be awkward with some people. But a lot of homes have those in rosemary. Definitely big enough for 2 couples and a child, maybe 2. Enjoyed our stay for sure. We very much appreciate your business and are glad that you enjoyed your stay in the Roger's Cottage! We are happy that you enjoyed the convenience of being on the beach walkovers away from the town center, as you are right in that they seem to be less busy. Please let us know if we can be of any assistance in the future and we look forward to accommodating you again! The house was great and everyone was extremely helpful. Great 2 week stay. House was in a good location close to everything in Rosemary. Having guests in the carriage house was odd at best due to the proximity of the carriage house entrance to the back porch of the main house and the fact that there are no window coverings on the main level back or front door - other than that it was a great stay. We very much appreciate your business, and your feedback. The carriage house is close to the main house, but we are glad to hear you enjoyed your vacation. We hope you thoroughly enjoyed your time at the Roger's Cottage and we look forward to accommodating you again! The place is beautiful and the location cannot be beat- one minute from the best pool at Rosemary and one minute from the beach. The rental agency is the best I have ever used. Extremely professional, very responsive. With respect to some of the other comments: yes, the garage is small but I fit a Honda Odyssey minivan in there - albeit with literally an inch to spare. And the carriage house is close, but it never posed a problem. There was a couple there all week and we rarely crossed paths. The bunk room is very small, but was perfect for our two boys. We had a pot or two that needed cleaning, but I put that on the prior renters and not the cleaning crew. I don't think you can expect them to go through every dish and pot in the kitchen. The house was really pretty and very well appointed. 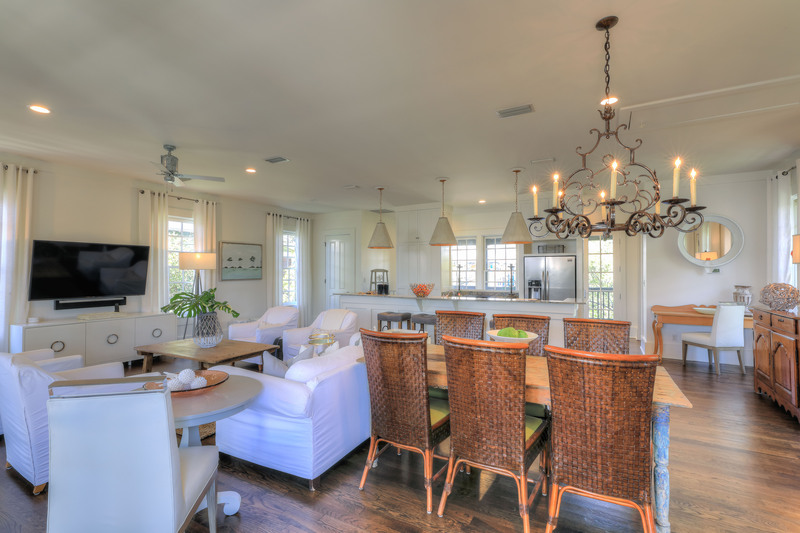 We will hopefully return soon and will book this house again - and definitely through 30A Luxury Rentals. Thank you very much for staying with us and we hope you return soon as well! It is hard to beat the conveinent location of this property and I'm glad you enjoyed your stay in the Rogers Cottage. Please let us know if we can be of any assistance in the future and we look forward to accommodating you again!